OM-21 Series are in the end of its life cycle. 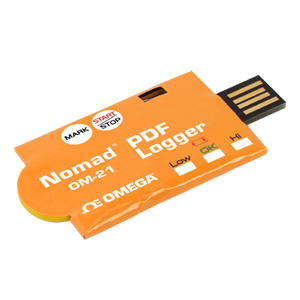 As a possible substitute/upgrade, please check out Newest Released One Time Use PDF Logger OM-21A Series for more advanced features with better price. The OM-21 data logger is for use in cold chain applications to monitor the transportation of pharmaceuticals, food and other temperature sensitive products. The data logger is completely user-programmable including language selection, sampling interval, start delay, alarm delay, temperature units, alarm range, alarm type, password and user name. The unit’s compact, lightweight, waterproof and flat design allows it to fit inside any package. No special software or driver is required for set-up or download of data. On completion of data logging a PDF report is automatically generated containing data summary, graph and tabular results. The data logger appears as a mass storage device when connected to the PC. User manual, set-up utility and PDF report are all stored in the data logger.